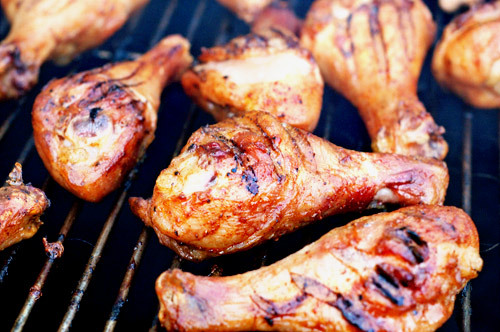 I'm sure I am not alone in hearkening back to fond childhood memories of sweet and sticky barbecued chicken legs cooked in the backyard. To me this is one of the most quintessential of all-American summer finger foods -- second perhaps to corn-on-the-cob. Hey, it's yardbird-on-the-cob! I see a lot of myself on the faces of my children when I see a drumstick in their hand and that familiar ring of BBQ sauce around their mouths (and usually on their shirt). It's just good times, ya know? Here is a very basic recipe that will please just about any crowd. The sauce was inspired by a guy whom I've never met, but I've seen a lot of him on a popular BBQ internet forum. His name is Rick Salmon, and I thank him for his inspiration. Mix the seasonings in a small bowl. Lay the drumsticks on a large sheet pan. Season all sides of each drumstick with a moderate sprinkling of the seasoning mixture. Put all of the chicken in a large zip-top bag and seal, removing the excess air. Refrigerate the chicken at least six hours, but preferably overnight. Start your fire and prepare for indirect cooking at 325º. Cook the chicken indirect until it reaches 170º internal (about an hour). Melt the jelly in a medium sauce pan over medium heat. Add the remaining sauce ingredients, whisk to combine, remove from the heat and set aside. Dunk each drumstick in the sauce, return to the cooker, and continue cooking indirect another 20 minutes (turning at 10 minutes). 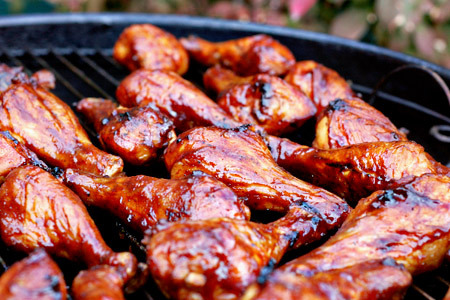 Remove the chicken from the grill to a large serving platter, and let rest 10 minutes. Thank you for this one. Easy to feed a lot of people inexpensively. I used homemade huckleberry jam as a substitute for the grape. Everyone enjoyed. I have used this recipe twice. Once for my boyfriend's birthday (his favorite meal is bbq drumsticks), and again tonight. Its been a hit both times. Thank you! I don't BBQ - can I cook in the oven?